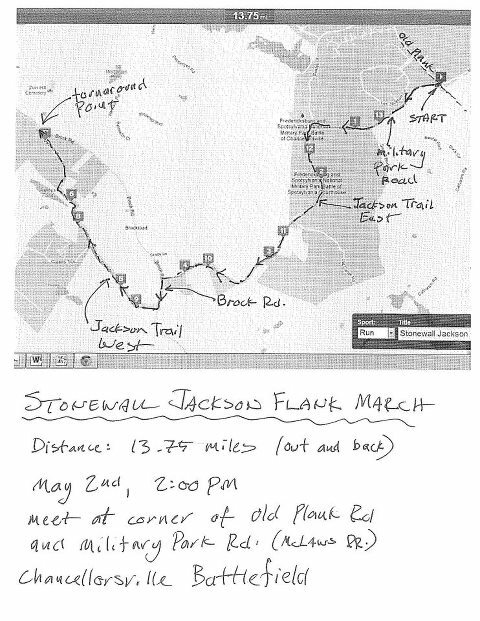 This Thursday, 2:00 PM - Stonewall Jackson Flank March HISTORY RUN! 150 years TO THE DAY after the historic Flank March of 1863 at the battle of Chancellorsville. 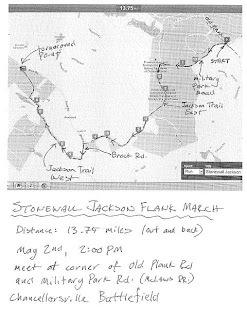 Become part of a new history and retrace Stonewall's steps! We will be leaving from the Lee/Jackson Bivouac site at 2:00 PM at the corner of Old Plank Road and Military Park Drive (McLaws Drive). Details and map are attached. If someone wants to lead a later group, let us know...or take a half day off work and join us! Good training run for the MCHH! If we have a volunteer to lead a later group, let us know. ALL PACES WELCOME. Those wanting to run a shorter distance can choose at which point they turn around. Remember it will only be the 150th anniversary of this event just once! Don't miss out!